Intellyo gives your enterprise a voice in the digital world by building & tracking your communication strategy in one turnkey solution. Kick off each content creation session focused, with a look at your customised Creator Engine Home dashboard. In three clicks you’ll get an overview of your past article’s performance, updates on active and upcoming tasks and access to your works-in-progress, so you can pick up right where you left off. Build campaigns with a targeted strategy to realise results with maximum impact. A full-scale breakdown of your organisation’s vision, strategy, persona and values are always at your fingertips so that every piece of content contributes directly to your goals. An automatically populated content calendar gives your process momentum and makes sure nothing slips through the cracks. 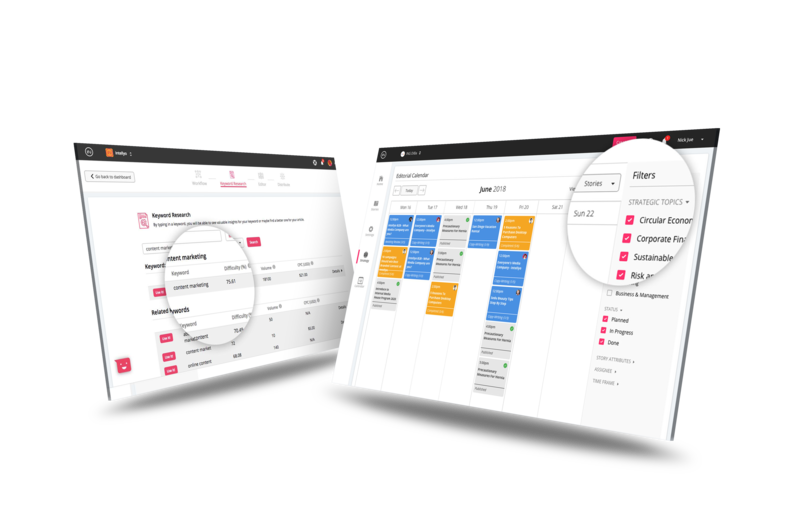 A visual at-a-glance overview shows you if and where you need to plan more content, while filter options and detailed info provide progress status, strategic goals, and assigned contributor roles for each piece. The Creator Engine’s workflow center is designed to cut down on organisation time to help your team start creating in minutes. Assign tasks, deadlines, event updates, briefs and feedback to members faster than the time it takes to open your inbox and click ‘compose email.’ Individual workflows update you on the progress status of assets so you immediately see where action is needed. Write content in a polished, streamlined platform. Set yourself up for success by reviewing the brief and any notes for the article and maximise your content’s value with additional keyword quality information and topic research. No distracting plugins or bloated interface, just the facts you need. Explore Intellyo's integrations to expand the possibilities in your content creation process. Import your stories to the Creator Engine from your CMS, Google Drive and Dropbox with a click for real-time collaboration. Add your distribution channels to your Intellyo organisation and share your content for your blog and social media in one place.